What does it mean to be European in a globalised world? After an extreme twentieth century, Europe must look to its intellectual and cultural heritage to re-imagine its identity. “A literate European is caught in the spider-web of an in memoriam at once luminous and suffocating”. These words of George Steiner might apply to the daunting prospect of introducing his work – a writer so erudite and illuminating as to embody the complexity he cherishes. In 2003, Steiner was invited by the Netherlands-based Nexus Institute to give its annual lecture, on the theme of ‘Culture as an Invitation’. The essay below is an extract, republished with the institute’s permission. There is much to admire here: the cadences of his prose, the breadth of his influences, the depth of his immersion. At a time of parochialism, let us appreciate his love of plurality and particularity, and his capacious and ever-curious intellect. “You have to remember there is so much to remember” – for Steiner, the past is both a burden and a gift, and it is the role of the critic to help us navigate the landscape. Europe is a ‘tale of two cities’, he argues; how apt it seems now to read of “the often weary, divided, confused children of Athens and of Jerusalem”. His astute reflections on America inspired this essay. In the 1930s, Steiner notes, the Germans wanted to be German, the Italians to be Italian, etc. – only the Jews aspired to be ‘European’. It took the Holocaust for the nations of Europe to realise the virtues of this common identity. As Europe lurches back towards nationalism, we would do well to remember this legacy, and the innumerably rich treasures of our shared civilisation. Europe is made up of coffee houses, of cafés. These extend from Pessoa’s favourite coffee house in Lisbon to the Odessa cafés haunted by Isaac Babel’s gangsters. They stretch from the Copenhagen cafés which Kierkegaard passed on his concentrated walks, to the counters of Palermo. No early or defining cafés in Moscow, which is already a suburb of Asia. Very few in England after a brief fashion in the eighteenth century. None in North America outside the gallican outpost of New Orleans. Draw the coffee-house map and you have one of the essential markers of the ‘idea of Europe’. The café is a place for assignation and conspiracy, for intellectual debate and gossip, for the flâneur and the poet or metaphysician at his notebook. It is open to all, yet it is also a club, a freemasonry of political or artistic-literary recognition and programmatic presence. A cup of coffee, a glass of wine, a tea with rum secures a locale in which to work, to dream, to play chess or simply keep warm the whole day. It is the club of the spirit and the poste-restante of the homeless. In the Milan of Stendhal, in the Venice of Casanova, in the Paris of Baudelaire, the café housed what there was of political opposition, of clandestine liberalism. Three principal cafés in imperial and inter-war Vienna provided the agora, the locus of eloquence and rivalry, for competing schools of aesthetics and political economy, of psychoanalysis and philosophy. Those wishing to meet Freud or Karl Kraus, Musil or Carnap, knew precisely in which café to look, at which Stammtisch to take their place. Danton and Robespierre meet one last time at the Procope. When the lights go out in Europe, in August 1914, Jaurès is assassinated in a café. In a Geneva café, Lenin writes his treatise on empirio-criticism and plays chess with Trotsky. Note the ontological differences. An English pub, an Irish bar have their own aura and mythologies. What would Irish literature be without the bars of Dublin? Where, if there had not been the Museum Tavern, would Dr. Watson have run into Sherlock Holmes? But these are not cafés. They have no chess-tables, no newspapers freely available to clients on their hangers. It is only very recently that coffee itself has become a public habit in Britain, and it retains its Italian halo. The American bar plays a vital role in American literature, in the iconic charisma of Scott Fitzgerald and Humphrey Bogart. The history of jazz is inseparable from it. But the American bar is a sanctuary of dim lightning, often of darkness. It throbs with music, often deafening. Its sociology, its psychological fabric are permeated by sexuality, by the presence, hoped for, dreamt of or actually of women. No one writes phenomenological tomes at the table of an American bar (cf. Sartre). Drinks have to be renewed if the client is to remain welcome. There are ‘bouncers’ to expel the unwanted. Each of these features defines an ethos radically different from that of the Café Central or the Deux Magots or Florian. “There will be mythology so long as there are beggars”, said Walter Benjamin, a passionate connoisseur of and pilgrim among cafés. So long as there are coffee houses, the ‘idea of Europe’ will have content. Europe has been, is walked. This is capital. The cartography of Europe arises from the capacities, the perceived horizons of human feet. European men and women have walked their maps, from hamlet to hamlet, from village to village, from city to city. More often than not, distances are on a human scale, they can be mastered by the traveller on foot, by the pilgrim to Compostela, by the promeneur, be he solitaire or gregarious. There are stretches of arid, forbidding terrain; there are marshes; alps tower. But none of these constitute a terminal obstacle. Europe has no Death Valley, no Amazonia, no ‘outback’ intractable to the traveller. This fact determines a seminal relationship between European humanity and its landscape. Metaphorically, but materially also, that landscape has been moulded, humanised by feet and hands. As in no other part of the globe the shores, fields, forests and hills of Europe, from La Coruña to St Petersburg, have been shaped not so much by geological as by human-historical time. At the glacier’s edge sits Manfred. Chateaubriand declaims on the rocky headlands. Our acres, be they under snow or in the yellow noon of summer, are those experienced by Bruegel or Monet or Van Gogh. The darkest woods have nymphs or fairies, literate ogres or picturesque hermits in them. The voyager seems never to be altogether out of reach of the church-bell in the next village. From time immemorial, rivers have had fords, fords also for oxen, ‘Oxfords’, and bridges to dance on as at Avignon. The beauties of Europe are wholly inseparable from the patina of humanised time. Again, the difference from North America, let alone so much of Africa and Australia, is radical. One does not go on foot from one American town to the next. The deserts of the Australian interior, of the American south-west, the ‘great woods’ of the Pacific states or of Alaska, are virtually impassable. The magnificence of the Grand Canyon, of the Florida swamps, of Ayer’s Rock in the Australian vastness, is that of tectonic, geological dynamics almost menacingly irrelevant to man. Hence the feeling, often voiced by tourists to Europe from the New World or ‘down under’, that European landscapes are manicured, that their horizons suffocate. Hence the feeling that the American, South African and Australian ‘big skies’ are unknown to Europe. To an American eye, even European clouds can seem domesticated. They are so crowded with ancient deities in Tiepolo costumes. Integral components of European thought and sensibility are, in the root sense of the word, pedestrian. Their cadence and sequence are those of the walker. In Greek philosophy and rhetoric, the peripatetics are, literally, those who travel on foot from polis to polis, whose teachings are itinerant. In western metrics and poetic conventions, the ‘foot’, the ‘beat’, the enjambment between verses or stanzas remind us of the close intimacies between the human body as it paces the earth and the arts of imagining. Much of the most incisive theorizing is generated by the act of walking. Immanuel Kant’s daily Fußgang, his chronometrically precise traverse of Koenigsberg, became legend. The meditations, the rhythms of perception in Rousseau are those of the promeneur. The extensive rambles of Kierkegaard through Copenhagen and its suburbs proved to be a public spectacle and the object of caricature. But it is these rambles, with their diversions, their abrupt changes of itinerary and gait, which are reflected in the syncopations of his prose. In an American age, which is that of the automobile and the jet, we can scarcely imagine the distances covered and put to intellectual and poetic purpose by European masters. Hölderlin goes on foot from Westphalia to Bordeaux and back. The young Wordsworth walks from Calais to the Berner Oberland and back. Coleridge, a portly individual, with various physical afflictions, routinely covers twenty to thirty miles per diem across difficult, mountainous ground, composing poetry or intricate theological arguments as he does so. And think of the role of the wanderer in some of the greatest of our music: in Schubert’s fantasies and songs, in Mahler. Again Benjamin’s enigmatic prophecy comes to mind: throughout European allegory and legend, the beggar who comes to the door, the beggar who may be a divine or daemonic agent in disguise, has come on foot. The streets, the squares walked by European men, women and children are named a hundredfold after statesmen, military figures, poets, artists, composers, scientists and philosophers. This is my third parameter. My own childhood in Paris found me taking, on numberless occasions, the Rue La Fontaine, the Place Victor Hugo, the Pont Henri IV, the Rue Théophile Gauthier. The streets around the Sorbonne are named after the high masters of medieval scholasticism. They celebrate Descartes and Auguste Comte. If Racine has his street, so do Corneille, Molière, Boileau. The same is true of the German-speaking world, of the myriad Goetheplätze and Schillerstrassen, of the squares named after Mozart or Beethoven. The European schoolchild, urban men and women, inhabit literal echo-chambers of historical, intellectual, artistic and scientific achievements. Very often, the street sign will carry not only the illustrious or specialised name, but the relevant dates and a summary description. Cities such as Paris, Milan, Florence, Frankfurt, Weimar, Vienna, Prague or St Petersburg are living chronicles. To read their street signs is to leaf through a present past. Nor has this pietas in any way ceased. The Place Saint-Germain has become the Place Sartre-Beauvoir. Frankfurt has named an Adornoplatz. In London, a prodigality of blue plaques identifies the houses in which not only medieval, renaissance or Victorian writers, artists, natural scientists are thought to have lived, but these associated with Bloomsbury and the moderns. Observe the almost dramatic difference. In the United States such memoranda are few. Endlessly, streets are named ‘Pine’, ‘Maple’, ‘Oak’ or ‘Willow’. Boulevards are entitled ‘Sunset’, the noblest of Boston streets is known as ‘Beacon’. Even these are concessions to the humane. American avenues, roads, streets are simply numbered or, at best, as in Washington, known by their orientation, their number being followed by ‘North’ or ‘West’. Automobiles just do not have the time to ponder a Rue Nerval or a Copernicus concourse. There is a dark side to this sovereignty of remembrance, to Europe’s self-definition as un lieu de la mémoire. The shields affixed to so many European houses tell not only of artistic, literary, philosophic or statesman-like eminence. They commemorate centuries of massacre and of suffering, of hatred and of human sacrifice. In one French town, a commemorative plaque to Lamartine, most idyllic of poets, faces an inscription on the opposite side of the street which records the torture and execution of resistance fighters in 1944. Europe is the place where Goethe’s garden almost borders on Buchenwald, where the house of Corneille abuts on the market-place in which Joan of Arc was hideously done to death. Memorials to murder, individual and collective, are everywhere. The marbled roll-call of the dead often seems to outnumber the living. Most problematic have been the decisions made, the methods employed, in reference to the reconstruction of the destroyed cities and artistic heritage. Doubtless, the millimetre by millimetre restoration of the old quarters of Warsaw according to eighteenth century topographical paintings is a wonder of craftsmanship and of willed recollection. As is the restitution of Dresden to much of its past radiance, or the facsimile-rebirth of many of the splendours of what was Leningrad. But as one walks amid these solid spectres, a sense of the uncanny, of utter sadness obtrudes. There is something wrong in all the rightness. As if even the perspectives of depth were only a façade. It is very difficult to put into words the warmth, the aura which authentic time, time as lived process, gives to the play of light on stone, on courtyards, on roof-tops. In the artifice of the reconstructed, the light has the taste of neon. The issue is, of course, a deeper one. Even a child in Europe bends under the weight of the past as he so often does under that of schoolbags far too crammed. How often, when plodding the Rue Descartes or crossing the Ponte Vecchio or passing Rembrandt’s house in Amsterdam, have I not been overwhelmed, in even a bodily sense, by the question: ‘What is the use? What can anyone of us add to the immensities of the European past?’ When Paul Celan enters the Seine to commit suicide, he choose the exact point celebrated in Apollinaire’s great ballad, a point situated below the windows of the room in which Tsvetaeva spent her last night before returning to desolation and death in the Soviet Union. A literate European is caught in the spider-web of an in memoriam at once luminous and suffocating. It is precisely this weave which North America repudiates. Its ideology has been that of sunrise and futurity. When Henry Ford declared that ‘history is bunk’, he was giving a password to creative amnesia, to a power of forgetting which underwrites the pragmatic pursuit of utopia. The most elegant of new buildings has an obsolescence factor of some forty years. The Vietnam War did cast an almost old-world shadow; the 11th of September did send a tremor, a memento mori through the American psyche. But these are exceptional and most likely transitory motifs. The strongest memories in American sensibility and idiom are these of promise, of that contract with open horizons which have made, of westward motion and scan, planetary travel a new Eden. Hence the growing malaise at the very thought of memorialising the destruction of the World Trade Center. Meanwhile a deliberately brutal and, in my view, misguided symbolic mausoleum entombs a central space in Berlin. How much truer to Jesus’s maxim ‘let the dead bury their dead’ are the men and women of the New World. The ambiguous weight of the past tense in the idea and substance of Europe derives from a primordial duality. This is my fourth axiom: the twofold inheritance of Athens and Jerusalem. This relationship, at once conflictual and syncretic, has engaged European theological, philosophic and political argument from the Church Fathers to Leon Chestov, from Pascal to Leo Strauss. The topos is as rich and urgent today as it ever was. To be a European is to attempt to negotiate – morally, intellectually and existentially – the rival ideals, claims, praxis of the city of Socrates and of that of Isaiah. The seminal role of Hellas is manifest. Three myths, which are among the most ancient in our culture, tell of the origins and mystery of music. What is arresting is the perception in archaic Greece, via the tales of Orpheus, of the Sirens and of the murderous contest between Apollo and Marsyas, of the elements in music beyond rational humanity, of the power of music to madden and destroy. Our mathematics have been ‘Greek’ at least until the proposal of non-Euclidean geometries and the crisis of the axiomatic implicit in Gödel’s Proof of non-consistency. To think, to dream mathematically is to follow on Euclid and Archimedes, on the first conjectures as to paradoxical insolubility in Zeno. Plato bade no man enter his academy who was not a geometer. He himself, however, directed the western intellect towards universal questions of meaning, of morality, of law and of politics. As A.N. Whitehead famously put it, western philosophy is a footnote to Plato and, one would add, to Aristotle and Plotinus, to Parmenides and Heraclitus. The Socratic ideal of the examined life, the Platonic search for transcendent certitudes, the Aristotelian investigations into the problematic relations between word and world, have set out the road taken by Aquinas and Descartes, by Kant and by Heidegger. 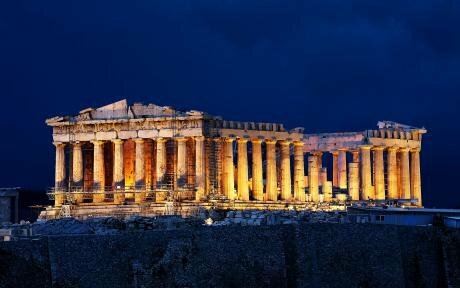 Thus these three pre-eminent dignities of the human intellect and of shaping sensibility – music, mathematics, metaphysics – underwrite Shelley’s statement that “we are all Greeks”. But the inheritance of Athens extends much further. The vocabulary of our political and social theories and conflicts, of our athletics and architecture, of our aesthetic models and natural sciences remains saturated with Greek roots in both senses of the word. ‘Physics’, ‘genetics’, ‘biology’, ‘astronomy’, ‘geology’, ‘zoology’, ‘anthropology’ are terms derived immediately from classical Greek. In turn, the names carry with them, as does ‘logic’ itself, a specific vision, a particular mapping of reality and its open horizons. It is an exaggeration, but a suggestive exaggeration, on Heidegger’s part to affirm that a false translation of Greek “being” or “to be” into Ciceronian Latin determined the destiny of Europe. It is no exaggeration whatever to add that this destiny springs no less from the legacy of Jerusalem. There is scarcely a vital node in the texture of Western existence, of the consciousness and self-consciousness of Western (and, thereafter, American) men and women which has not been touched by the heritage of the Hebraic. This is as true of the positivist, of the theist, of the agnostic as it is of the believer. The monotheistic challenge, the definition of our humanity as in dialogue with the transcendent, the concept of a supreme Book, the notion of law as inextricable from moral commandments, our very sense of history as purposeful time, have their origin in the enigmatic singularity and dispersal of Israel. It is a cliché to cite Marx, Freud and Einstein (I would add Proust) as the begetters of modernity, as the artisans of our current condition. But underneath the cliché lies a formidably complex situation: that of secular Judaism and of the translation into secular terms and values of profoundly Judaic antecedents. Marx’s rage for social justice and messianic historicism are directly concordant with that of Amos or Jeremiah. Freud’s strange assumption of an original crime – the killing of the father – mirrors, graphically, the scenario of the Adamic fall. There is much that is wonderfully close to the promise of the psalms and of Maimonides in Einstein’s trust in cosmic order, in his tenacious refusal of chaos. Judaism and its two principal footnotes, Christianity and utopian socialism, are descendants of Sinaï, even where Jews themselves were nothing but a despised, hunted handful. Relations have never been easy. The tension between Jew and Greek obsesses the Pauline invention of Christianity. The Church Fathers are anxiously alert to the dual magnetism of pagan Athens and Hebrew Jerusalem. How is the truth of Jesus to incorporate the indispensable legacy of classical Greece? – a legacy made the more troubling by its transmission via the Arab and Muslim world. Time and again, the polarities sharpen. More often, European humanism from Erasmus to Hegel seeks diverse farms of compromise between Attic and Hebraic ideals. But after a lifetime of scrupulous inquiry, Leo Strauss, equally steeped in Talmud and Aristotle, in Socrates and Maimonides, concluded that no satisfactory understanding could be negotiated between the ultimate imperatives of philosophic-scientific reason as set out in our Greek heritage and the imperatives of faith and revelation proclaimed in the Torah. Syncretism, however ingenious, would always be flawed. Thus, the ‘idea of Europe’ is indeed a ‘tale of two cities’. My fifth criterion is an eschatological self-awareness which, I believe, may well be unique to European consciousness. Long before Valéry’s recognition of the “mortality of civilizations” or Spengler’s apocalyptic diagnosis, European thought and sensibility had envisaged a more or less tragic finality. Christendom never relinquished completely that expectation of an end to our world which had so deeply marked its early, synoptic days. Long after what historians have called “the panic of the year one thousand”, prophecies of eschatological doom, numerologies which seek to fix its date, throng the European popular imagination. But such expectations were rife not only among the less educated. They busied no less a mind than Newton’s. In a secular, intellectualised format, a “sense of an ending” is explicit in Hegel’s theory of history as it had been in Carnot’s momentous formulation of entropy, of the inevitable extinction of all energy. Or think of the panoramic paintings of European cities in flame or under raging floods which are so curious an aspect of romantic art. It is as if Europe, unlike other civilizations, had intuited that it would one day collapse under the paradoxical weight of its achievements and the unparalleled wealth and complication of its history. Five axioms to define Europe: the coffee house; the landscape on a traversable and human scale; these streets and squares named after the statesmen, scientists, artists, writers of the past; our twofold descent from Athens and Jerusalem; and, lastly, that apprehension of a closing chapter, of that famous Hegelian sunset, which shadowed the idea and substance of Europe even in their noon hours. From Sarajevo to Sarajevo, ethnic hatreds, chauvinistic nationalism and regional claims have been Europe’s nightmare. The ethnic cleansing and attempted genocide in the Balkans are only a recent example of a plague which extends to Northern Ireland, to the Basque country, to the divisions between Fleming and Walloon. Legitimately, the global spread of the Anglo-American language, the technological standardisation of daily life, the universality of the internet, are taken to be great steps towards an abrogation of frontiers and ancient hatreds. Innumerable organisations – legal, economic, military and scientific – strive towards an ever-increasing degree of European collaboration and, ultimately, union. The fantastic success of the American model, of its federalism across immense distances and differing climates, calls for imitation. Never again must Europe succumb to internecine warfare. Yet this ideal of unison is undeniable. It inspires important elements of European thought and statesmanship since Charlemagne. But it is, I believe, only one side of the picture. The genius of Europe is what William Blake would have called “the holiness of the minute particular”. It is that of linguistic, cultural, social diversity, of a prodigal mosaic which often makes a trivial distance – twenty kilometres apart – a division between worlds. In contrast to the awesome monotony which extends from western New Jersey to the mountains of California, in contrast to that lust for sameness which is both the strength and vacancy of so much of American existence, the splintered, often absurdly divisive map of the European spirit and its inheritance, has been inexhaustibly fertile. Shakespeare’s ringing phrase ‘a local habitation and a name’ identifies a defining character. There are no ‘small languages’. Every language contains, articulates and transmits not only a unique charge of lived remembrance, but an evolving energy of its future tenses, a potentiality for tomorrow. The death of a language is irreparable; it diminishes the possibilities of man. Nothing threatens Europe more radically – ‘at the roots’ – than the detergent, exponential tide of Anglo-American, and of the uniform values and world-image which that devouring esperanto brings with it. The computer, the culture of populism and the mass-market, speak Anglo-American from the night-clubs of Portugal to the fast-food emporia of Vladivostok. Europe will indeed perish if it does not fight for its languages, local traditions and social autonomies; if it forgets that ‘God lies in the detail’. This assignment is one of the spirit and of the intellect. It is nonsense to suppose that Europe will rival the economy, military and technological might of the United States. Already Asia, China in particular, is set to surpass Europe in demographic, industrial and, ultimately, geopolitical significance. The days of European imperialism and diplomatic hegemony are as far gone as the worlds of Richelieu, of Palmerston and of Bismarck. The tasks, the opportunities now before us are precisely these which witnessed the high morning light of Europe in Greek thought and Judaic morality. It is vital that Europe re-affirms certain convictions and audacities of soul which the Americanisation of the planet – with all its benefits and generosities – has obscured. Let me formulate these all too briefly. The dignity of homo sapiens is exactly that: the realisation of wisdom, the pursuit of disinterested knowledge, the creation of beauty. Making money and flooding our lives with increasingly trivialised material goods is a profoundly vulgar, emptying passion. It may be that in ways as yet very difficult to make out, Europe will generate a counter-industrial revolution even as it generated the industrial revolution itself. Certain ideals of leisure, of privacy, of anarchic individualism, ideals almost stifled in the conspicuous consumption and uniformities of the American and Asian-American models, may have their natural function in a European context, even if that context entails a measure of material retrenchment. Those who knew Eastern Europe during the bleak decades, or Britain in austerity, will know what human solidarities and creativities can derive from relative poverty. It is not political censorship that kills: it is the despotism of the mass-market and the rewards of commercialised stardom. These are dreams, perhaps unforgivably naïve. But there are practical ends worth aiming for. It is desperately urgent that we arrest, so far as is possible, the drain of our best young scientific (but also humanistic) talent from Europe to the edenic offers of the United States. If our best scientists, our finest young architects, our musicians and scholars abandon Europe, if the gap between American and European salaries, career opportunities, resources for research and collaborative discovery is not bridged, we are indeed doomed to sterility or the second-hand. Already, in key domains, the situation is almost desperate. Yet correction of this is not beyond our means. If young Englishmen choose to rank David Beckham high above Shakespeare and Darwin in their list of national treasures, if learned institutions, bookstores, concert-halls and theatres are struggling for survival in a Europe which is fundamentally prosperous and where wealth has never spoken more loudly, the fault is very simply ours. As could be the re-orientation of secondary education and the media which would amend that fault. With the collapse of Marxism into barbaric tyranny and economic nullity, a great dream – that, as Trotsky proclaimed, of common man following in the wake of Aristotle and Goethe – was lost. Free of a bankrupt ideology, it can, it must be dreamt again. It is only in Europe, perhaps, that the requisite foundations of literacy, that the sense of the tragic vulnerability of the condition humaine, could provide a basis. It is among the often weary, divided, confused children of Athens and of Jerusalem that we could return to the persuasion that ‘the unexamined life’ is indeed not worth living.